Located at 2650 and 2710 Ogden Ave. on Chicago’s West Side, the Odgen Courts development is mostly occupied by single parent households, headed by women. The apartments are in deplorable conditions. Mice, lead poisoning and dirty water are only a few of the problems we face daily. And many of us suffer from depression, asthma and other ailments. There are shootings, fights and other conflicts constantly. One of the most violent acts that has happened here at Ogden Courts between residents was a fight between four women, including the former LAC president, Latresha Green. Also involved was her twin sister, Lakisha, and her mother, Debra. The three of them jumped on a young lady. There were two eye witnesses. One was the young lady’s seven-year-old son. 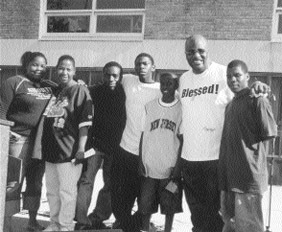 July 10, 2004 was not the first time Bishop Larry Trotter of Sweet Holy Spirit Church brought a true gospel program to the residents of Harold Ickes. In the all purpose social arena, we were treated to uplifting, soul stirring singers and gospel happy dancers. The program was planned to remind weary souls of the power of the spiritual side of life, the joy of seeking a new way of life and the proof of happiness found as confessed by members of the visiting congregation. Incentives or mandates: which tool will increase affordable housing in Chicago? On the one hand, Mayor Richard M. Daley wants to use density bonuses as incentives for developers to build affordable housing units. On the other side, several alderman are proposing strict mandatory requirements to ensure affordable units and better meet the needs of low-income residents. At a May 26 press conference, the Mayor announced zoning changes that he says will have an impact on affordable housing in Chicago. More than one year ago, We The People Media began a new effort that has recently produced the first of what will be an ongoing series of reports relating to the CHA Plan for Transformation, the agency’s $1.5 billion effort to totally redevelop public housing in Chicago. The creation of “What People Want: The Relocation Information Center Feasibility Study” has expanded We The People Media’s employment of public housing residents in the pursuit of resident-based documentation and analysis of the low-income communities in and around public housing developments.